Former Portland Police Chief Michael Sauschuck answers questions before the criminal justice and public safety committee at the State House in Augusta on Friday. Sauschuck is Gov. Janet Mills' nominee for public safety commissioner. AUGUSTA, Maine — Former Portland police Chief Michael Sauschuck’s nomination for Maine public safety commissioner advanced past a legislative panel along party lines on Friday despite support for gun control policies that became the main focus of an hourslong hearing. The nomination of Sauschuck, 48, of Windham, a Marine veteran who served for more than 20 years for Portland’s department before taking a city administrative job last year, has never been in danger, but he quickly emerged as by far Gov. Janet Mills’ most controversial Cabinet pick. A gun rights advocate stands in the Hall of Flags at the state house in Augusta on Friday. That became clear during an almost-six hour confirmation hearing before the Legislature’s public safety committee, when people from all over Maine testified that Sauschuck posed a threat to Second Amendment rights. More than 100 people signed up to testify on the nomination, including more than 60 opponents who hit solely on guns. While in charge of police in Maine’s largest and most liberal city, Sauschuck was a prominent progressive voice in the state’s traditionally restrained law enforcement community, publicly campaigning for gun control policies and establishing a diversion program for drug users. 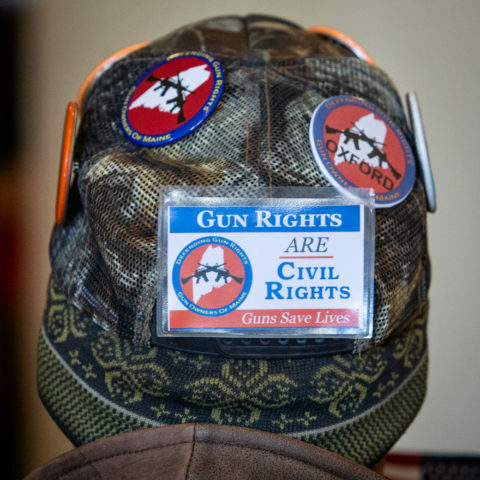 Prior to the hearing, an estimated 200 gun-rights supporters turned out for a State House rally. 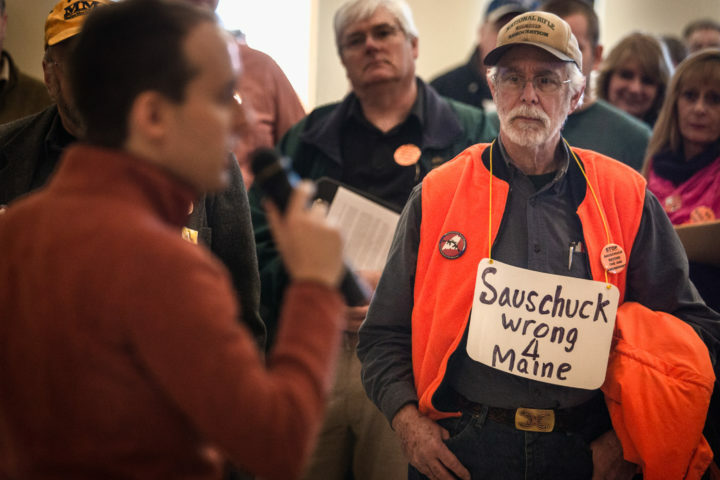 Gun-rights groups including the National Rifle Association, Gun Owners of Maine and the Free Maine Campaign implored their supporters to oppose Sauschuck. The Democratic governor’s first 13 Cabinet nominees won unanimous votes from lawmakers in hearings this week until Sauschuck, who was opposed by all five Republicans on the panel. The Maine Senate must approve nominees after hearings, which had been muted until Friday. Sauschuck advocated for an unsuccessful 2016 referendum that would have expanded background checks to private gun sales that lost because of wide opposition in rural Maine. He opposed a 2015 change that nixed Maine’s concealed handgun permit requirement and has backed gun magazine limits. In his testimony, Sauschuck highlighted his work in Portland in establishing procedures to provide peer support to officers and dealing with people who have mental illnesses. He was firm when lawmakers asked about his stances on guns, giving gun-rights Republicans few reasons to vote for him while saying both that he was serving constituents and his department by speaking out on gun issues. Chris Kravitt of Waltham listens to Eric Brakey speak at the State House in Augusta on Friday opposing former Portland Police Chief Michael Sauschuck's nomination as the state public safety commissioner. Sauschuck is an outspoken gun control advocate. 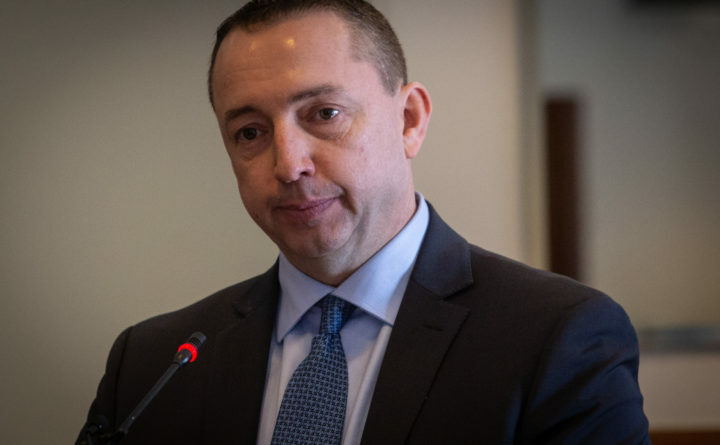 “That’s not to say that in a position that deals with statewide issues and statewide agencies that you don’t have the ability and the opportunity to work with other people and to learn their perspective and to deal with those kind of things,” he said. “She could have chosen a lot of people out there that were very well-qualified that don’t have the baggage,” he said of Mills. Mills’ record in Augusta is mixed on guns. As a legislator in the first decade of the 2000s, she received A ratings from the National Rifle Association — which led to attacks on her from the left during her 2018 primary. She backed many gun control measures, including expanded background checks. As attorney general, Mills helped craft a proposed “red flag” law in 2018 that would have allowed guns to be seized from people deemed dangerous by a court. Mills has tacked back to the political middle on guns. In 2019, Democrats have proposed more than 20 bills that look to be aimed at gun control, including one that looks to largely replicate the 2016 referendum. Mills told reporters last month while she would consider each proposal, Maine voters have spoken “loud and clear” on background checks. While many referenced those remarks on Friday, they weren’t much relief to a suspicious and arch-conservative rally crowd.